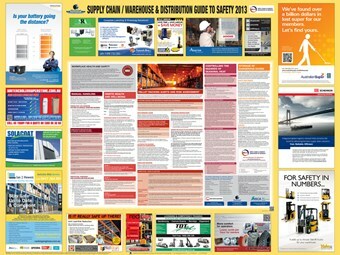 Pro-Visual Publishing has released the 2013 supply chain, warehouse and distribution safety guide. According to Pro-Visual publishing, the Supply Chain/Warehouse & Distribution Guide to Safety, touches on the most relevant safety issues in the industry. Released in partnership with the Supply Chain & Logistics Association of Australia (SCLAA) and National Safety Council of Australia, the guide covers manual handling, onsite health and wellbeing, pallet racking audits and risk assessment, storage of dangerous goods, and hazard communication when working alone. The guide is distributed at no cost to recipients throughout Australia, and copies are available on request. Recipients of the guide are also provided with the opportunity to enter a competition in which the best entry wins $5,000! Terms and Conditions are available on the website link below. Competition closes mid-December 2013. Pro-Visual Publishing is a specialist in wall-mounted workplace health and safety, food safety and hygiene and health and wellbeing information resource charts. Charts are designed as a quick reference point for management and staff.